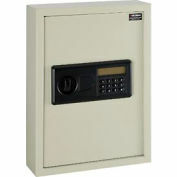 The hotel, dorm and patient safes are specially designed for personal in room use. 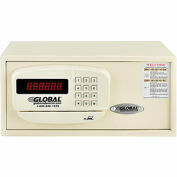 The safe is made of steel for long lasting durability. 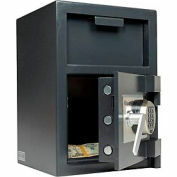 Pry resistant recessed door for anti-theft protection. Concealed hinges prevents door removal and ensures a lifetime of smooth operation. Interior space with removable carpet to protect your laptop and valuable belongings. 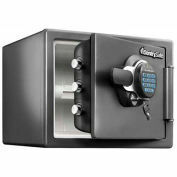 Features advanced battery-operated electronic card-swipe lock. Accepts almost any card with a magnetic strip. 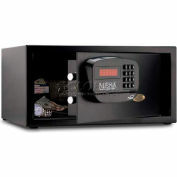 Operate the safe using the keypad or the card-swipe. 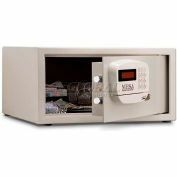 Large LED display shows the status of the safe. 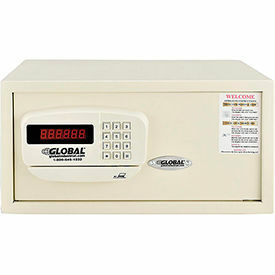 Battery operated electronic lock. (4AA batteries required, not included). 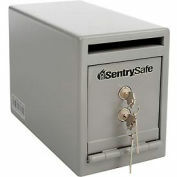 Mechanical override keys (2 keys included) used to bypass the electronic lock if the batteries expire. 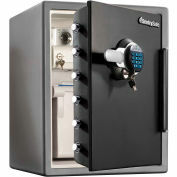 The keypad will go into a lockout penalty if combinations are entered incorrectly. Anchor holes allow wall and floor mounting for unit stability (Hardware included). 1 year limited warranty.